All squares start off as 'unknown' - neither shaded nor clear, indicated by muddy orange. Just click on a square to shade a square. If it is already shaded it will instead be marked back as unknown. Right-click or Alt-click on a square to mark it as clear, or unknown if it is already clear. Drag the mouse to set multiple squares in one go. Hold down Shift whilst dragging to toggle squares back and forth as you move. Click on 'Check solution' when you finish the puzzle (it will flash to remind you if you have marked every square). 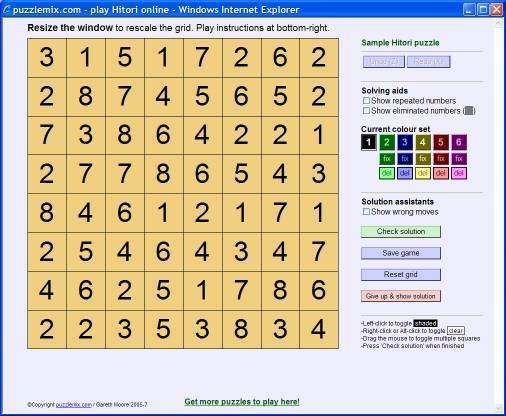 This submits your time and lets you rank the puzzle - it doesn't close the window so your solved puzzle won't vanish. You only need to mark shaded squares to solve the puzzle - there is no need to mark in any or all empty squares unless you want to. Save game: Click this button to save your precise game state. Next time you open this puzzle from the menu it will re-open at exactly the same position. Give up: If you click on 'Give up & show solution' then the solution is revealed complete with red numbers for squares you solved incorrectly and green numbers for squares which were correct. This lets you see where you went wrong - if you did! You are also given the chance to rank the puzzle, based on how difficult you were finding it. Show repeated numbers will underline any numbers in unshaded squares that are repeated in a row or column. Show eliminated numbers will shade in dark grey any unknown or empty squares which are in the same row or column as an empty square of the same number, since these must be shaded to obey the rules of Hitori. '1', '2', '3', '4', '5' and '6': These colour buttons change the current shaded and empty square colours that will be applied to any squares you click on. This is purely a solving aid - it has no effect on the correctness or otherwise of the puzzle. Each of the six colours has a 'shaded' (dark) and 'empty' (light) colour and they are all considered equivalent when checking the status of the puzzle. You can also press the equivalent number key to change colour. Fix buttons: Each 'fix' button will convert all shaded and unshaded squares of the relevant colour to black and white shaded and unshaded squares. This is useful if you were using an alternative colour to try out a hypothesis that you now wish to convert to black and white. Del buttons: Each 'del' button will set to unknown all shaded and unshaded squares of the relevant colour. 'Del' is short for 'delete'. This can be useful if you have been using a colour to test out a possible solution that you now wish to abandon. You can use alternate colours either to help you keep track of different parts of your solution, or simply because as an alternative to black and white for aesthetic purposes. Show wrong moves consults the solution to the puzzle and highlights any solution numbers in incorrectly marked squares in bold italic. Check solution will tell you how many incorrectly-marked squares you have in the puzzle and how many remaining shaded squares you have to place, unless you have solved it successfully in which case it will log your completion time and pop open the puzzle ranking and comment window.